Hamilton, Bermuda (AP) — Redemption for a gutty crew of five New Zealanders and one Australian came on the turquoise waters of Bermuda’s Great Sound, four years and 3,000 miles removed from one of the most brutal collapses in sports. With a mixture of ingenuity and national pride, Emirates Team New Zealand got back up after taking a gut punch for the ages, came to the Bermuda Triangle and ripped the America’s Cup right out of tech tycoon Larry Ellison’s hands. “We’re on top of the world,” helmsman Peter Burling said Monday after steering the Kiwis’ incredibly fast 50-foot foiling catamaran to the clinching victory in the 7-1 rout of two-time defending champion Oracle Team USA. As soon as the red-and-black Kiwi cat crossed the finish line, the normally reserved crew began whooping and jumped up onto the trampoline netting and into a joyful group hug. Magnums of champagne arrived and Burling and crewman Blair Tuke, who won Olympic gold and silver medals together, sprayed the crew. The crew enjoyed beers together before going ashore. About an hour later, with the America’s Cup set on a podium, Burling and Glenn Ashby grabbed it together and lifted it over their heads. As the silver trophy was passed around, some team members poured champagne into it and took swigs. At 26, Burling becomes the youngest helmsman to win sailing’s greatest prize in a competition that dates to 1851. The only non-Kiwi on the crew is Ashby, a 39-year-old Australian, multihull wiz and Olympic silver medalist who serves as skipper and controls the space-age wingsail with an Xbox-like device. Ellison, the Silicon Valley maverick worth an estimated $62 billion, watched the humbling defeat from a chase boat and later shook hands with his crew. He was joined by New Zealander Russell Coutts, the CEO of Oracle Team USA who suffered his first defeat in six America’s Cup finals. It was Coutts who first won the America’s Cup for the small sailing-mad island nation, skippering Team New Zealand to a five-race sweep of Dennis Conner off San Diego in 1995. 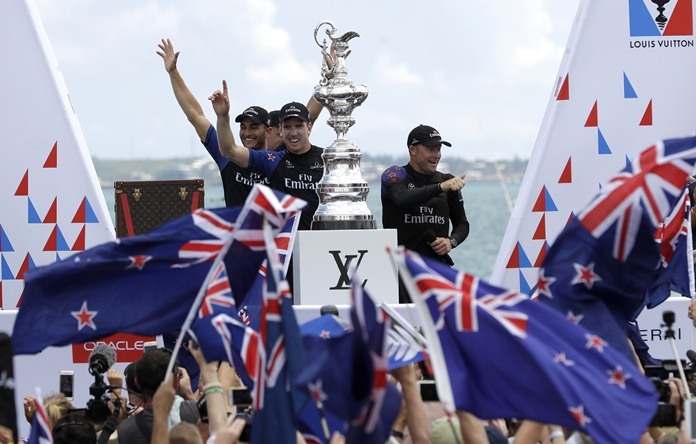 Team New Zealand started this match with a negative point because Oracle won the qualifiers, forcing the Kiwis to win eight races to return the Auld Mug to the Royal New Zealand Yacht Squadron in Auckland for the first time since 2003. It was sweet atonement for the Kiwis. In 2013 on San Francisco Bay, Team New Zealand, then led by Dean Barker, reached match point at 8-1. Oracle then staged one of the biggest comebacks in sports, winning eight straight races to retain the Auld Mug. Ashby is the only member of the sailing crew who returned from that collapse. “It was absolutely brutal for the team. It was a hard pill to swallow,” Ashby said. “For myself and a lot of the other guys that are with the team this time around, it is a great redemption and just a relief to right the wrongs of the last campaign. We obviously learned a lot from that campaign. Thousands of sleepy New Zealanders got up at 5 a.m. to watch the race on television. “It’s David and Goliath. We beat the biggest and the best in the world, so that’s just fabulous,” said Roger Foley, who watched with dozens of others at the Royal Port Nicholson Yacht Club in the capital, Wellington. Many felt relief as well as elation after the heartbreak of the 2013 campaign. The nation’s Prime Minister, Bill English, posted a short video of himself celebrating at home: “We are so proud of you,” he wrote on Twitter. The underfunded Kiwis trained in Auckland — shadowed by Oracle spy boats — until arriving in Bermuda in late April. They bounced back from a capsize in the challenger semifinals. “We knew with this format that we had to be extremely innovative and extremely aggressive with our design philosophy,” Ashby said. “We sort of all as a group agreed and recognized, I guess, where the bar will eventually get with our sport and we tried to fast-track that learning process as fast as we could. In Race 9, skipper Jimmy Spithill put Oracle in the lead rounding the first mark. But the faster Kiwi cat overhauled the American-flagged boat and sailed into the lead on the downwind second leg. The Kiwis won by 55 seconds. In 2010, Spithill became the youngest skipper to win the America’s Cup, at 30. That was the first of two Cup victories for Ellison. Italy’s Luna Rossa Challenge will be the Challenger of Record for the 36th America’s Cup, helping Team New Zealand decide the rules and class of boat.